"I am sure this building with its memorial tower will be a wonderful landmark between the two principal cities of this state for many years to come." These are the words of Sir Ernest Clark, Governor of Tasmania, on Friday 28 October 1939 at the opening of the new Town Hall at Campbell Town. It was built by local builders W Lockett and Sons on land donated by Miss Leake whose family were among the founders of Campbell Town. Mr W Lockett snr spoke at the opening saying that this building capped of his 51 year career in Campbell Town and he was now leaving it to his three sons and three grandsons to carry on. Mr Roy Smith from the Launceston architects, East, Roy Smith & Willing also spoke at the opening thanking the Governor and city representatives for their complimentary references to the architecture. 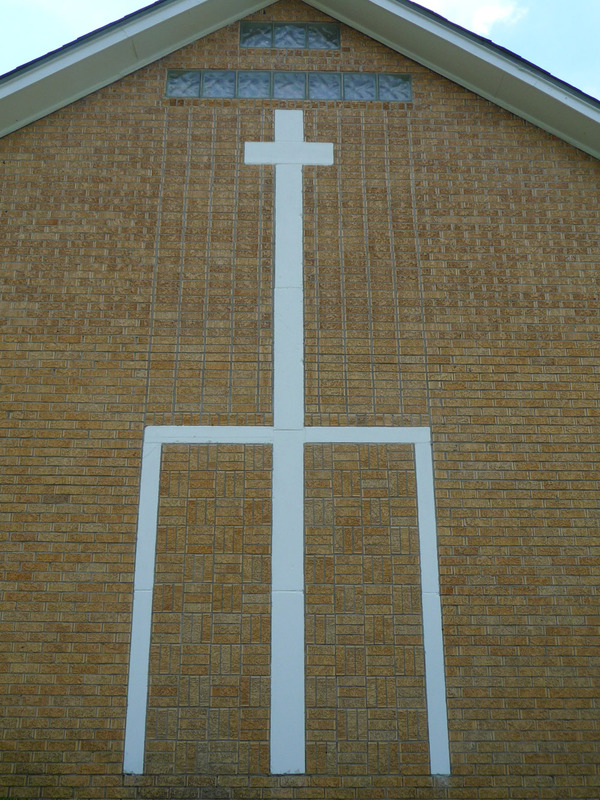 It may not surprise you to learn that the memorial tower was added after the building had already been designed. Dr Walter Henry Tofft settled in Campbell Town in 1891 having been educated at Hobart High School and Edinburgh University and then serving as resident physician at the Edinburgh Infirmary and the Glasgow Royal Infirmary. In Campbell Town he was Warden of the municipality for 12 years and was a executive member of several local and state trusts and institutions. He was the district health officer and medical officer at the hospital for 24 years. He established a hospital for the tuberculosis in the Tasmanian Midlands which closed due to his absence serving in the AIF Medical Services in WWI. At the conclusion of the war he was awarded an MBE. Dr Tofft died at his residence Brookdale on Sunday 29 January 1939. 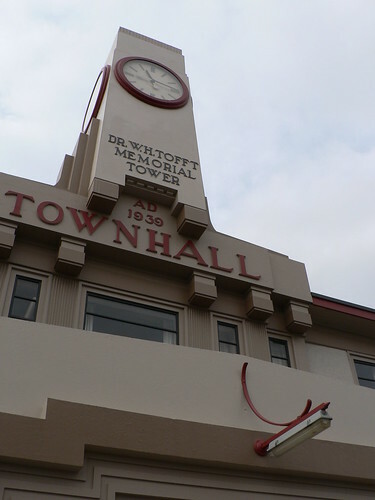 A meeting in Campbell Town on Saturday evening 6 May 1939 finalised the arrangements for the erection of a clock tower as a memorial to Dr Tofft. The cost would be met by public subscription and £220 of the estimated £250 had already been raised. The tower looks, as it was, added on. The construction of the hall started in November the previous year so it was not just a matter of altering plans, so all things taken into account, I don't think they did a bad job. It looks like a small but perfectly designed town hall. I agree that anyone who was a district health officer and medical officer at the hospital for 24 years deserves to be publicly honoured. Especially if he also established a hospital for the tuberculosis. But why not a stained glass window in his name? Or a nice plaque on a wall? Or a memorial gate in front of the town hall? Why a tapering erect member in the centre of the front? So many options, maybe having raised 220 quid they felt they needed something big. The proportions of the building in relation to the clock tower I have always found a little strange in that it does looked like 2 separate builds, one added onto the other. I reckon if you take away the main entrance and the building looks more Georgian than it does Art Deco. I agree. The hall itself looks like an older style of building. It would be interesting to see what other changes (if any) were made to accommodate the tower. 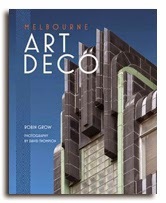 Yes, a lot were "refitted", the Council Chambers in New Norfolk was originally a Georgian building and it was made over in the Deco style. 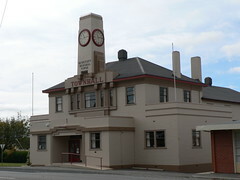 Judging from the links to newspaper articles I posted above and this article from the Launceston Examiner 13 Aug 1938 the Town Hall was built on vacant land starting around November 1938 and the memorial tower was added to the design sometime around May 1939 while the building was under construction. It would be great to have a time-machine to go back and see what really did occur.